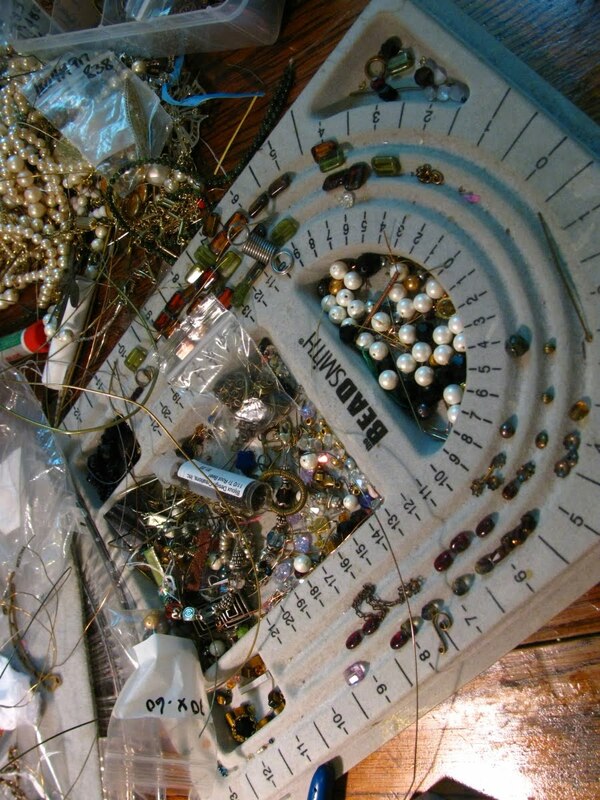 Bajuna Jewelry's Helpful Hint Blog: Let Your Creative Juices Flow! I've been really stuck. My kitchen table slash bench looks like a tornado hit it. I tried my usual method of touching and feeling my beads, filigrees, stampings and making little piles and moving things around on my bead board. When you get stuck or blocked or your creative juice gets clogged, sometimes you just need to let go. Yup, let go! Stop it! Lay it down! Drop it! I said drop it! Your creative juices just won't flow if you are stuck and you try to force them. I'm not telling you to give up crafts. I'm just telling you to lay it down. Let go with your vise grip, your choke hold, so you can let yourself live and enjoy yourself and get out of the slump. Go do something. Go for a walk. Get some fresh air to that brain. Do something nice for a family member. Call your grandmother. Refuse to even think about the artwork for a while. Don't even look at your stash. I know this sounds silly but inspiration can come when you least expect it if you let go. Mine came suddenly while I was in the kitchen making dinner for my family! 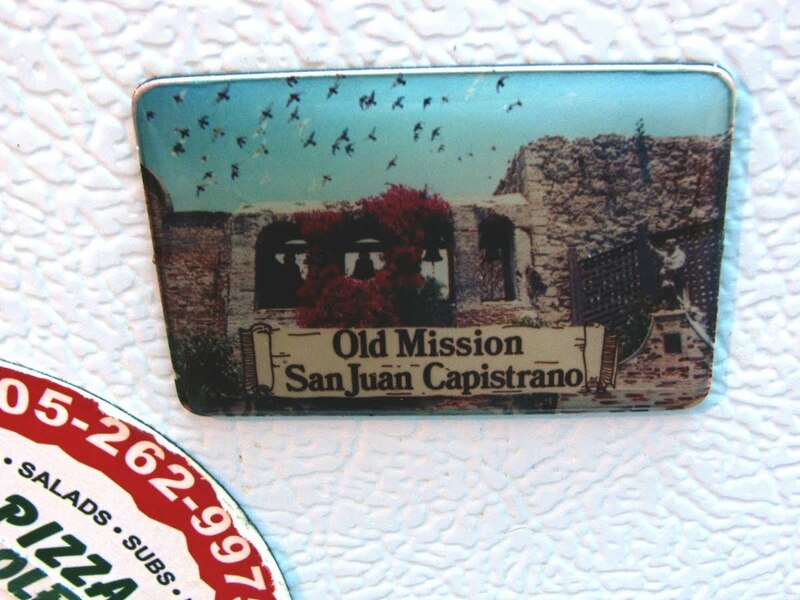 My refrigerator is covered with magnets and this one happened to catch my eye from a trip to California. I got it! I'm inspired by a refrigerator magnet! Mission San Juan Capistrano! A flood of images comes to mind and the cobwebs are gone! Beautiful Mission San Juan Capistrano! Cabbage sized roses, fushia bougainvillea and swallows fill my mind! Bees buzz and the sun heats my face. The swallows, high upon the walls, flit back and forth from their nests catching bugs in the garden. When I sleep, colors fill my room! I know what I'm going to do! I have all these beautiful brass stampings of swallows and flowers and even a cross with a pretty floral design that I had bought from Jill's store Brass Bouquet. I joined my pretty brass findings with jump rings and pretty chain Jill calls Ariel and finished it with a small lobster clasp. 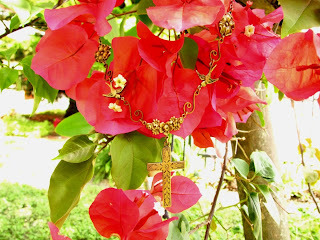 I called my pretty necklace Mission San Juan Capistrano! This necklace is beautiful, and it so great to hear what inspired this piece. Thanks for sharing! I couldn't agree more! I do the same with writing. When I hit a wall, I walk away. It's that outside, random inspiration that brings me back to it.